Identifying Great Innovators in the Workplace: Nikola Tesla – Crazy Scientist or Great Inspirational Innovator? Let’s stop kidding ourselves about what innovation really is. We’re commonly overusing and misapplying the word in the workplace today. Let’s not call a new flavor of yoghurt or a new mouth rinse bottle, innovation. More accurately, they are simple line extensions. Historically many of the great technological, scientific and artistic leaps forward were by a rare super group of true inspirational innovators that “jump started” and moved civilization forward in a quantum leap. What are the characteristics of that rare super group of true inspirational innovators and is it possible to identify innovation characteristics of great innovators? This post is part of a series examining great inspirational innovators and identifying true innovator characteristics and behaviors. The goal is to develop a model that will help companies/managers/venture capitalists identify, hire, manage, motivate, reward and retain real innovators who might develop a new disruptive product. See for example my previous posts on Antoni Gaudi  and Harry Brearley  which identify common personality attributes and innovation characteristics, as well as posts on motivation and reward models [3,4,5,6] for “inventor/innovator employees”, and posts that will help you differentiate innovators as either adaptive or creative [7,8]. Along these lines, I became interested in another great, but somewhat forgotten, innovator…. Nikola Tesla….Tesla invented the alternating current (AC) electrical power system which led to the second industrial revolution and became the dominant power system of the 20th century. More currently, entrepreneurs like Steve Jobs or Elon Musk are considered archetypal modern inspirational innovators of the third industrial revolution, often called the digital revolution. There are many similarities between the historical inspirational innovators of the second industrial revolution and modern innovators of the digital revolution. 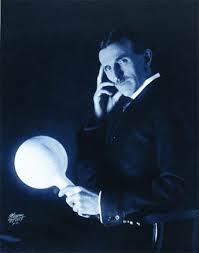 History of Nikola Tesla …Nikola Tesla was born on July 10, 1856, in Smiljan, Croatia. Tesla’s interest in electrical invention was influenced by his mother, Djuka Mandic, who invented small household appliances in her spare time while her son was growing up. Tesla’s father, Milutin Tesla, was a priest and a writer, and he wanted his son to join the priesthood. In 1884, Tesla arrived in the United States penniless, only with a letter of introduction to Thomas Edison, whose electrical inventions were hot items at the time. Edison hired Tesla to make improvements to Edison’s inventions. However, several months later, the two parted ways due to a conflict over payment for Tesla’s work. After leaving Edison in 1885, Tesla received funding for the Tesla Electric Light Company and worked to develop improved arc lighting. After successfully doing so, however, Tesla was forced out of the company and for financial reasons had to work as a manual laborer. In 1887, he secured funding for his AC electrical system and filed several patents for AC-based inventions. Tesla’s AC system caught the attention of George Westinghouse, who was seeking a solution to supplying the nation with long-distance power. Convinced that Tesla’s inventions would help him achieve this, in 1888 he purchased his patents for $60,000 in cash and stock in the Westinghouse Corporation. Tesla and Westinghouse were in direct competition with Thomas Edison, who was intent on selling his direct-current (DC) system to the nation. A negative-press campaign was waged by Edison, in an unsuccessful attempt to undermine interest in AC power. Tesla patented several more inventions during this period, including the “Tesla coil,” which is still used in radio technology today. Fortunately for Nikola Tesla, the Westinghouse Corporation was chosen to supply the lighting at the 1893 World’s Columbian Exposition in Chicago, and Tesla conducted demonstrations of his AC system there. Two years later, in 1895, Tesla designed one of the first AC hydroelectric power plants in the world at Niagara Falls. The output from this plant was used to power the city of Buffalo, New York. With this success, the AC system would quickly become the preeminent power system of the 20th century, and it has remained the worldwide standard ever since. 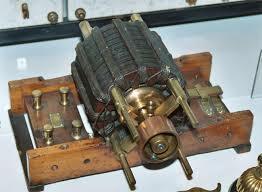 Tesla’s Inventions …In addition to his AC power system and coil, Tesla also discovered, designed and developed ideas for a number of other important inventions, including, dynamos (electrical generators similar to batteries) and the induction motor (photo below), many of which were officially patented by other inventors. He was also a pioneer in the development of neon and fluorescent lights, radar, X-rays, radio and remote control by radio. Similarly he was also very interested in the wireless transmission of power, may have received radio signals from space (i.e. radio astronomy), developed a steam powered mechanical oscillator and claimed to have developed a directed-energy weapon. All in all, Tesla is known to have been granted at least 278 patents. As an example of his creativity, his last US patent U.S. Patent 1,655,114 was for a tiltrotor/tiltwing biplane that would take off vertically and then gradually achieve horizontal flight like a normal plane. It was powered by a turbine engine. Both these ideas were a first that have now been executed in the form of the V-22 Osprey aircraft of the US military. How did Tesla Invent? …Tesla had a photographic memory and had visions which might provide a solution to a problem he was working on. Tesla was able to envision an invention in his mind in precise detail. He typically did not make drawings of his inventions but worked from memory. This makes it difficult to know if some of his outrageous claims, especially later in life, were real and based on something definitive in his mind or not. Surprisingly his inventions were not based on a deep and sophisticated understanding of modern physics. He did not believe in subatomic particles or even the electron as a carrier of charge but believed in the notion of an “ether” that transmitted electrical energy. He did not believe in the inter-conversion of mass and energy as proposed by Einstein or in the notion of curved space-time. His skill set was more based in experiment, coupled with an intuitive understanding of electromagnetism and where these technologies might be headed well before other people at the time. Tesla was well ahead of his time in predicting the wireless transmission of information and power, and predicted or partially developed many related technologies; for example, remote control, neon and fluorescent lights, wifi, radio and radar. In some cases he was able to build working prototypes including a radio-controlled boat in 1898, a patent for radio in 1900 before Marconi, and he postulated wifi and radar might work. Given that many important inventions he prototyped became commercially successful and important, it is easy to see that Tesla was one of the most important innovators of the early 20th century period. 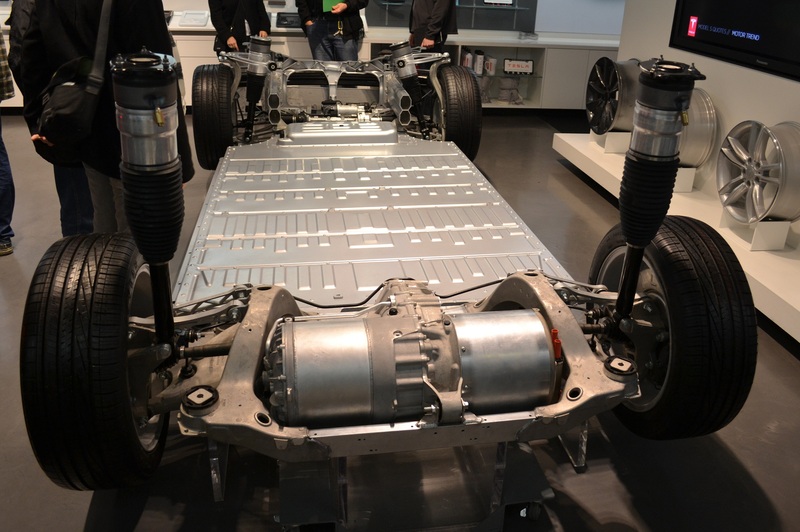 Here is a photo of induction motors that are of Nikola Tesla’s original design used in a modern Tesla motor car developed by Elon Musk’s company….. The comparison to Thomas Edison is interesting. Their personalities and motivation were very different. While Edison was a powerful figure who focused on marketing and financial success, Tesla was an idealist who was not commercially savvy and somewhat vulnerable to commercial exploitation. In terms of innovation temperament that I explored in earlier posts [7,8,9], Edison was definitely an adaptive innovator as opposed to a creative innovator. Adaptive innovators tinker with ideas, produce lots of prototypes and make incremental improvements to products. On the other hand, creative innovators like Leonardo da Vinci are gifted in thinking about new ideas but are typically not good in translating ideas into reality. Even though Tesla was an experimentalist he was more of a creative innovator than an adaptive innovator. He let many great ideas slip through his fingers for others to patent and commercialize and was more interested in the “big” picture, often letting others execute development and commercialization of his ideas. In fact Tesla is considered the archetypal “mad scientist”, but in hindsight it is incredible how he was at the center of the initiation of a large number of the most important innovations of the 20th century – proof that these two characteristics are not mutually exclusive. Notable Tesla Quotes …The following quotes have been attributed [10,11] to Tesla and demonstrate the love and commitment Tesla had for invention to the point that money only had value to Tesla as a way to fund future experimentation. These quotes reveal a great deal about Tesla’s thoughts, motivation and inspiration and by extension, may be helpful to companies wishing to identify innovators in their midst as well as provide important clues for (performance) management of these unusual workers. Comparison of Tesla’s and Gaudi’s Innovation Characteristics …Tesla reminds me of another incredible and inspiring innovator, Antoni Gaudi . Both were productive in the late 19th and early 20th centuries. Both had similar innovation characteristics and personalities. Both had a strong feeling that they had to work for the service of mankind (quotes 4,5). Both were deeply religious and drew inspiration from religious sources and from nature (quote 6). Both never married and felt that marriage would hinder their professional projects. Both were not motivated by external motivational factors like money (quotes 1,2,3). Both were uninterested in fame or social status, although Tesla liked to dress well, and had meticulous eating and sleeping habits. Both were vegetarians. Both had an uncommon ability to draw on and combine elements from their spiritual awareness, artistic/scientific sensibilities, observations of nature, and technological expertise and relentlessly led others to build structures so large in scope (or design experiments/technologies so large in scope) and complexity that most would say it couldn’t be done. Both were inspired by the beauty and aesthetics of nature and a deep understanding of the physical laws of nature. Both were deeply religious and drew inspiration from nature. Tesla for example was a good friend of John Muir, conservationist and founder of the Sierra Club. Gaudi used many plant-based motifs in his architecture. Both invented unique engineering methodologies and had deep content expertise across multiple disciplines, especially in engineering and mathematics. This enabled them to develop new engineering solutions to the problems they encountered. Both had a relentless intrinsically driven obsession for work. Both were workaholics who worked late into the night and early morning and slept little. Both were unmarried and completely committed to their work to the extent that money did not matter to them. Both had powerful benefactors who funded their projects. In the case of Gaudi, it was Eusebi Guell, a Catalan industrialist who financed many projects and Bishop Josep Torras i Bages. Tesla had many influential friends including Mark Twain, John Muir, Robert Underwood Johnson but Tesla was funded on some of his most important projects by George Westinghouse and J. P. Morgan, both captains of American industry. Both had deep technical expertise. In the case of Brearley it was the art of steel making and in the case of Tesla it was in the area of electricity and electro-magnetic devices. Both developed their innovations in a “skunk works”. Tesla in fact developed his own “skunk works” several times….Tesla Electric Light & Manufacturing, Tesla Electric Company (1/3 of profits would fund further development), Colorado Springs and Wardenclyffe. In Brearley’s case, two ajoining steelworks set up a joint research laboratory which Brearley headed and had co-ownership of patents. Both had an obsession with helping mankind. Brearley was definitely better at profitably commercializing his inventions than Tesla and almost certainly a better businessman. Tesla however wanted to serve mankind and understood the importance of commercializing his technology even if it meant he would make no money. Both believed in the development of working prototypes to generate excitement about their inventions and to demonstrate the practicability of their inventions. Brearley made prototypes of his stainless steel knives and Tesla made numerous prototypes of his electro-magnetic inventions e.g. motors, dynamos & oscillators. Both worked in fields where the timing was right. Brearley was in the right place (Sheffield, England), at the right time in terms of steel making and cutlery. Tesla was in NYC during the Edison era when the second industrial revolution was just starting and the use of electricity and electrical devices was blossoming. Both innovators were at the epicenters of their fields when significant progress was being made. They were in the right place at the right time. Both were “futurists” in the sense that they understood the importance of their inventions. Brearley clearly understood the future uses for a rust-resistant steel and Tesla famously said “The present is theirs; the future, for which I really worked, is mine.” Tesla clearly understood the future use of his technological inventions well before others but had trouble convincing others of his vision. Comparison of Tesla to Modern Day Inspirational Innovators like Elon Musk and Steve Jobs …Tesla, Elon Musk and Steve Jobs have many attributes in common but differ in many ways as well. Business was conducted differently one hundred years ago. They (Tesla, Musk & Jobs) were all huge risk takers. In many cases they bet the company (and their own personal wealth) on a new technology or a new product that they passionately believed in. All are “futurists” and altruistic in that they seemed to be able to understand the importance of their inventions and how their inventions might be used in the future. All three innovators seem to have a very clear vision of the future. In the case of Tesla and Jobs, they were eerily accurate. Musk’s vision of electric cars, cheap space travel and hyperloop transportation also seems to be on track. Clearly Tesla’s weakness relative to Jobs and Musk was his inability to get things to market and generate a commercial success for himself or his companies. Jobs and Musk were much more adept as businessmen and were also adept managers and CEOs. Nikola Tesla was not a manager or marketer and definitely wasn’t driven by making money. They were all in the right place at the right time. Silicon Valley was the right place to be involved with the digital revolution where Jobs and Musk have made their marks. Tesla was in the right place and the right time for the beginning of the second industrial revolution; New York City was the center for development of electrical power and electro-magnetic devices. Incidentally, Nikola Tesla and Elon Musk emigrated from foreign countries to be “in the right place at the right time”. Conclusion …Nikola Tesla had many characteristics in common with both historical and modern-day inspirational innovators. Perhaps the most important characteristics are his complete obsession with invention, altruism, incredible risk-taking, clear future vision, and being in the right place at the right time. One characteristic that sets Nikola apart from his modern counterparts is his lack of business savvy relative to modern day successful entrepreneurial innovators. Innovators that make quantum differences in today’s society are almost all accomplished businessmen as well as innovators. True, Apple started with Steve Wozniak as the engineering guru who designed the Apple I & II, but without Jobs, Apple would likely have failed. Tesla was more of an altruistic inventor rather than an entrepreneurial innovator. I suspect that if Tesla was around today, he would not have been able to secure funding for his inventions since today those in venture capital and the world of finance rarely understand the inventor’s mind or motivation and most likely Tesla would not have been as prolific. He was too much of an odd-ball. Tesla was an amazing inventor but not an entrepreneur. Someone like Tesla needs an entrepreneurial or corporate partner to fill those support roles. Although inspirational innovators like Tesla are uncommon there are still plenty of original, innovative minds “hidden in full sight” in our companies, often dismissed as unmanageable, crazy scientists who aren’t team players. That is a sad thought, especially for someone interested in innovation like me because these colleagues are probably vastly under-utilized and mismanaged in their company’s R&D departments. Developing an integrated innovator behavior model would help identify common personality attributes and innovation characteristics, provide motivation and reward metrics for “inventor/innovator employees” [3,4,5,6], and will classify the different types of innovators, for example as either adaptive or creative [7,8], making it easier to develop corporate roles and responsibilities. Hopefully as line extensions run out and your company is driven to pursue more innovative solutions, a deeper understanding of innovator behaviors and motivations will help identify, hire, manage, motivate, reward and retain real innovators and your company will be driven to innovation crescendo. Do you ever feel that the word “innovation” has become such an over-used buzzword in today’s corporate culture, that we’ve lost sight of what it really means and how to nurture it? What are the characteristics of that rare super group of true inspirational innovators that we all “know when we see them” and is it possible that they share a fundamental set of characteristics in common? This question prompted me to look at people I think are inspirational innovators to see if they exhibit a common personality profile or have certain innovation characteristics in common. 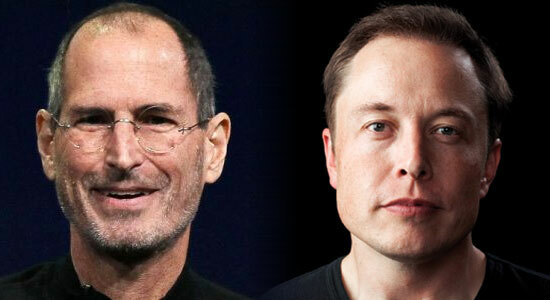 Today, entrepreneurs like Steve Jobs or Elon Musk are the typical examples of inspirational innovators. Similarly, historically important innovators like Thomas Edison or Leonardo de Vinci have also received praise as the innovators of their time. In this post I have chosen another innovator that made a very deep personal impression on me, one often forgotten by the modern innovation authors … Antoni Gaudi. Brief History of Antoni Gaudi … Antoni Gaudi was a highly individualistic Catalan architect who lived from 1852 – 1926 and whose best known works are found in Barcelona. After his death, (hit by a tram and unrecognized as a beggar) Gaudi’s works were not very popular with international critics who regarded them as excessively imaginative. In the 1950s and later, his work became more recognized and was championed by Salvador Dali and others. Increasing recognition culminated with seven of his major works being listed as UNESCO World Heritage Sites during 1984 – 2005. 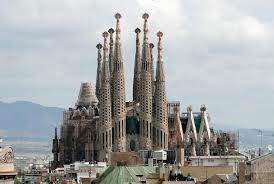 Perhaps his most famous work is the Sagrada Familia church. Fir st Impressions … When I saw Gaudi’s major works, I was struck by their creativity and vision. For structures designed approximately a century ago, they seemed fresh, organic, ahead of their time, and totally unlike anything else from that period or even now for that matter. 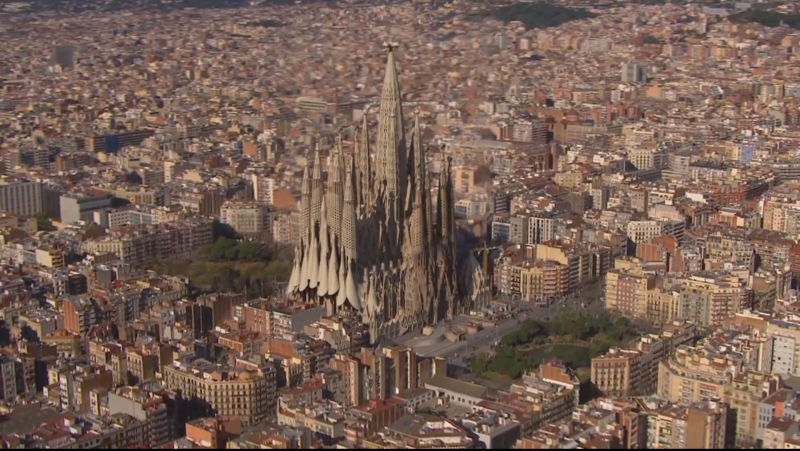 His most famous, but still unfinished work is the Sagrada Familia church , which is due to be completed in 2026. When completed it will be the tallest church in the world. When you experience his work you cannot help but be moved by it. I have attached various images of the Sagrada Familia to give you an idea of this amazing structure both from the inside and outside. The image below shows what the church will look like when it is finished. Gaudi’s Innovations … Gaudi exemplifies the inspirational innovator who thinks completely “outside the box”. 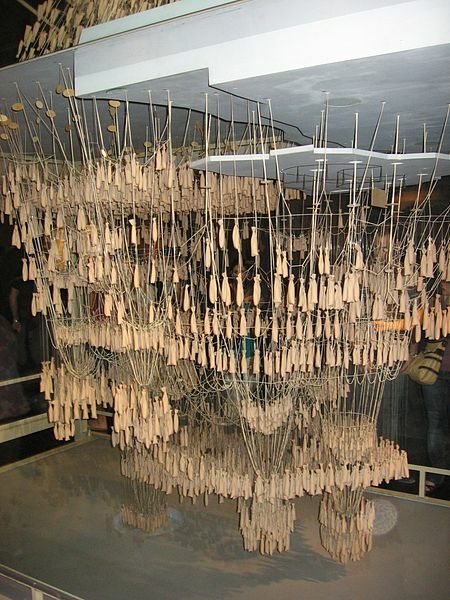 3) Gaudi used inverted scale models of his proposed structures using weights supported by strings which produced the correct catenary curves and surfaces required to minimize stresses in the design and allowed him to eliminate supporting beams or buttresses which had been necessary until then. This was Gaudi’s equivalent of computer modeling; without this modeling technique he could not have built his now famous structures. 4) He integrated the use of iron and reinforced concrete into construction which allowed for great strength in his structures. 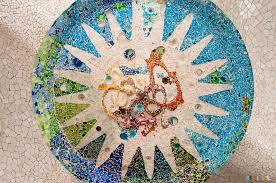 5) He invented a way of designing ceramic mosaics from waste pieces (now called “Trencadis”). 6) He invented a new technique for making stained glass using three glass planes of the three primary colors varying the thickness of the glass to influence the intensity of the light that diffused through. 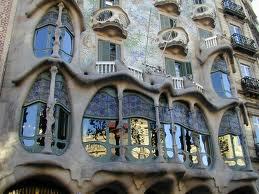 6) Gaudi had a relentless intrinsically driven obsession for his work. Gaudi exhibited a very keen sense of observation. Gaudi was a diligent observer of nature and translated this information into his use of ruled geometric forms, the hyperbolic paraboloid, hyperboloid and the helicoids forms found in nature in his architecture. He noticed and studied the organic and fractal patterns found in nature and replicated them into his architectural designs and he was one of the first to use Biomimicry in his design. Some of these shapes have been rediscovered and used in modern structures; for example, the cooling towers in nuclear power plants. 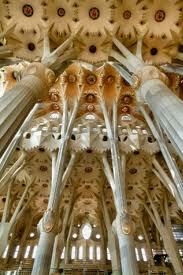 Nature was Gaudi’s inspiration and he believed nature to be both functional and aesthetic. Gaudi was profoundly religious and there was a connection his love of nature and his religious beliefs. Gaudi has been quoted  as saying, “Those who look for the laws of Nature as a support for their new works collaborate with the creator”. Gaudi developed a unique methodology. For example, Gaudi used inverted, scale models with weights supported by strings to identify optimal structures for load bearing. This was truly innovative and allowed him to design complex structures that most people were not capable of conceptualizing until the age of computer modeling. Gaudi had a deep content knowledge in engineering techniques and many building techniques including reinforced concrete and the decorative arts. Gaudi also had a deep understanding of materials and techniques such as sculpture, wrought ironwork, stained glass, ceramics, plaster modeling and the use of iron and reinforced concrete. Without this deep technical knowledge, Gaudi would have been unable to have his structures built to his vision. All his content expertise was embedded in his innovations. Gaudi insisted on executional excellence. He paid attention to detail in his design. As a result, his physical structures were breath-taking. They literally change the way we think about architecture. Gaudi, unlike Leonardo de Vinci, was able to translate his vision into physical structures by executing his ideas so that we can still enjoy them today. His innovations were not limited to having a creative idea but were about translating and experiencing them in the real world. When the Sagrada Familia is completed it will be one of the largest, tallest and probably the most complex stone church ever constructed. Finally, there is the deep seated motivation for Gaudi’s innovations. Gaudi had a passion, indeed an intrinsically driven obsession for his work that was independent of extrinsic rewards like money or recognition. He died poor, dressing in rags, yet he had a relentless attention to detail and perfection to the end, often sleeping at “his” Sagrada Familia church. Gaudi’s obsession to build the Sagrada Familia was inspired by his intrinsic love of nature and driven by his religious and aesthetic beliefs. Wealth and other external factors did not motivate him [5,6]. Summary … Gaudi exemplifies the inspirational innovator. He was a careful observer of nature where he found a source of great inspiration; he used an innovative methodology, had deep content expertise, was able to execute his vision, and had an unyielding obsession to complete his work. Like other inspirational innovators he did not want to design a derivative structure (product) based on others’ ideas. He wanted to design something completely new. I plan to explore these innovation characteristics in later case studies of other inspirational innovators to see if there are commonalities in their innovation characteristics. I suspect that other famous innovators will share many of Gaudi’s innovation characteristics. While the Gaudis of the world are rare and their innovation traits are at the extreme edge of the innovation spectrum, they can teach us much about how to nurture, motivate and reward innovators who are currently struggling in corporate cultures which are unfriendly to innovation. Brent Saunders’ presentation examined the “health” of our current healthcare system and concluded that the “incentives” part of the equation was lacking and inhibiting innovation. His premise was that the US healthcare system was organized to provide treatment for patients with diseases and injuries but was not sufficiently incentivized for preventative medicine, which will be required to make the US healthcare system more efficient and cost effective in the long term. The macro issue raised by his presentation was how do we to incentivize and innovate in a healthcare system that works under a Byzantine system of laws and regulations and is resistant to change. Talent and Culture are not enough to guarantee Innovation … Brent Saunders’ equation for innovation got me thinking about how incentives influence innovation in R&D. Many companies espouse mantras like “Performance = Talent + Culture”2 but innovation is something more than just performance. If you follow my blog, you will know that I have often posted about the importance of both corporate culture and talent for innovation in R&D. However a company may have all the talent in the world and a great culture but innovation may still be stifled by a lack of openness, bureaucracy, regulations, lack of risk-taking and lack of speed to market. What incentives are there for people within R&D to innovate? How can you use incentives to improve innovation quantity and quality within a company? In this post I am going to focus on the need for incentives for people in R&D (or generally in the company) to improve innovation metrics. The Relationship between Motivation and Incentives … Self Determination Theory links the question of incentives to motivation.3,4 Both incentives and motivation increase the tendency to successfully develop an innovation. For example, incentives can be financial, such as salary increases, bonuses, stock options. However, incentives can also be prestige or status based such as promotions, lunch with the CEO or being named the project lead on a cross functional project team. Sometimes incentives such as not losing your job or avoiding failure in a project are also powerful. where Ts is the tendency to successfully develop an innovation, Ms is the motivation of success, Ps is the probability of success and Is is the incentive value. This equation says that an innovation goal is more likely to happen if both the motivation for success and/or the incentive value are high. Paradoxically, often the motivation and the incentive values are higher for a difficult goal than for an easy goal. This means that R&D folks are often more motivated by a difficult project than by an easy one, or by project that will be a disruptive innovation verses one that won’t, or by a project that meets some important unmet consumer need, or by a project that will help others in a philanthropic way. By contrast, line extension projects that involve minor improvements to a product are not going to get R&D workers very motivated. This is where incentives can help. “Necessity is the Mother of all Invention” … Of course one of the best motivating factors and incentives is necessity. Difficult situations encourage inventive solutions. When the need for something becomes imperative you are forced to find ways of achieving it. War is an example of a difficult situation that has fostered many great innovations. World War II was the catalyst for many innovations such as the development of radar and jet engines and the catalyst for “splitting the atom”. Since most scientists and engineers in R&D are primarily motivated by intrinsic factors, an R&D leader who recognizes intrinsic satisfaction (e.g. to develop products that will better society), and offers opportunity for reputational rewards, and also offers a great compensation package will be positioned for innovation. However, many people in R&D feel that their work is largely controlled by factors beyond their control and leadership that has little experience or understanding of product development and this leads to job discontent and stagnation. People in R&D need to feel that they are important in the company and not just a cog in a machine. Treating R&D people as backroom geeks, uninterested in understanding the business landscape, is a sure way of demotivating R&D. Incentives that give control back to R&D workers work well. For example, funding a project an R&D worker proposed and making them the project lead. Incentives to remove bureaucracy, delayering management and simplifying processes also resonate. Incentives to improve communication skills and training to understand the business landscape will reap benefits. Status and prestige, especially in front of their peers but also the company at large, are also good incentives. Company-wide recognition such as “We really need R&D to come through on this project or the company will be in trouble” is likely to motivate people in R&D. Financial incentives, unless directly linked to the success of projects, are probably the least effective incentives, although financial compensation must always be competitive. Incentives are a huge component of Innovation, but understanding how to leverage them to improve motivation is crucial. 5. Excerpt From: Walter, Isaacson. “Steve Jobs.” Simon & Schuster, 2011-10-23T21:00:00+00:00. iBooks.